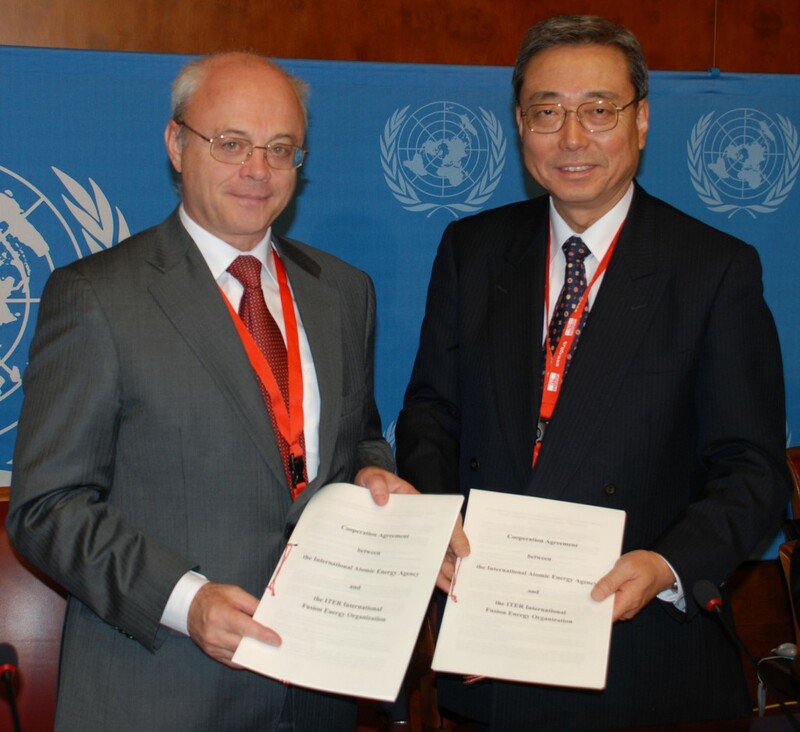 On 13 October 2008, the Deputy Director General of the International Atomic Energy Agency (IAEA), Yury Sokolov, and Kaname Ikeda, Director-General of the ITER Organization, digned a Cooperation Agreement emphasizing the close cooperation of the two organizations. Yury Sokolov and Kaname Ikeda after the signature. The IAEA has been closely involved with ITER since the very beginning. Early cooperation phases and the ITER negotiation phases, for example, took place under the auspices of the IAEA. The Director-General of the IAEA is the Depositary of the ITER Agreement. The Cooperation Agreement signed today will join the two organizations even more closely "with a view to facilitating the effective attainment of the objectives set forth in the Agency's Statute and the ITER Agreement." IAEA representatives will be invited to attend ITER Council meetings and—vice versa—ITER representatives will be invited in the annual conferences of the IAEA and its scientific and technical committees. If necessary, representatives of both IAEA and the ITER Organization will reciprocally attend other meetings of common interest such as the International Fusion Research Council (IFRC), Coordinated Research Projects and ITER Scientific and Technical Meetings. The IAEA and the ITER Organization may also cooperate on training, joint publications and organization of scientific conferences, plasma physics and modelling, materials development and fusion safety and security. The Agreement, entering into force today, will be communicated to the Secretary General of the United Nations for registration and publication.